I purchased flax seeds and wanted to drink flax in juice, so I have been grinding the seeds up to add to juice and to my cereal. The flax thickens in juice and the liquid turns into jello consistency and I can't even drink flax. What does this do in my stomach and do you have suggestions for how to use it? Must grains do thicken when put in liquid (even oatmeal does -the smaller the grain and more finely ground, the more it thickens). This thickening happens because of the fiber -and this is one of the ways it helps your body. Healing Flax Fiber - Your body breaks down the flax into protein, fiber, and so many other nutrients. The fiber in flax is both soluble and insoluble fiber, and the soluble fiber of flax includes an important fiber called mucilage. Mucilage is soluble fiber that heals and protects the colon, which is important for everyone, and especially those who have bowel irritations or family histories of colon cancer. Texture of Flax - First, you are not alone, getting used to the texture of flax in liquid when you drink flax takes time or you may never get used to it. I recommend eating flax in smoothies, protein shakes, yogurt, applesauce, cottage cheese and other thicker foods -yes, it will thicken a little more, but not the same way it will in liquid. Thicker Ground Flax - Also, if you grind your own flax, don't grind it as long so it is a thicker grind so that it won't thicken up as much. This is what my daughter does. You can also buy cold milled flax, which is not as thin of a grind and takes a little longer to thicken up in liquid. Other ways to eat ground flaxseed are on salads and toast -click here for more. Don't Let Flax Sit - If you really want to drink the flax in liquid, don't grind it as long or try drink flax that is cold milled flax, then add 1 to 1-1/2 Tablespoons to the liquid. DO NOT let the liquid and flax set, mix it and drink flax as quickly as you can. My husband puts his in water each morning and has no problem with it getting thick because he drinks it right away. I put less water in my flax and eat it as cereal. Freeze For A Smoothie - If you don't drink it up quickly enough and it's getting to thick or you don't like the texture in liquid, we recommend freezing the flax juice (make it a little sweeter than normal by adding some juice concentrate and then freeze it). This makes a perfect icy slushy when you are in the mood for a great snack! Flax is so valuable for your health, and worth figuring out how you like to eat it best! 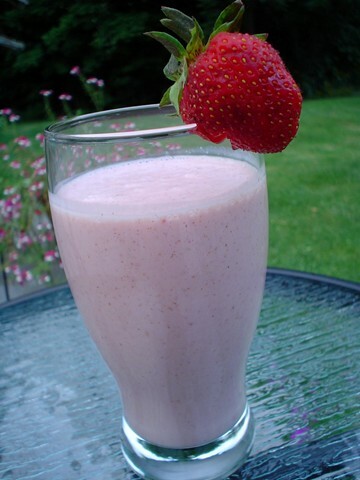 My favorite way is to add flax to my smoothies with fresh fruit. I also like to take a small ziploc bag of the pre ground (cold milled flax) to work to add to my yogurt. It's a perfect snack! Thanks for the other tips!